At the time, his remarks caused me to think about the idea of “intersections,” and how they relate to what we do at Augustana. In the wake of his death, I thought about it even more. I believe that Augustana sits at the intersection of the liberal arts and life – unbinding, absolute, passionate, all-consuming life. What we do here – the broad-based knowledge our talented professors provide; the support and guidance offered by our seasoned residential life teams; the exposure and perspective gained through international travel; and the ideas that swell from a culturally and ethnically diverse campus – defines the liberal arts. 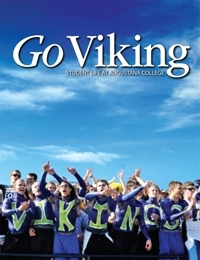 After their time at Augustana, we believe that our graduates are well-suited to contribute and thrive in virtually any field because their foundations are strong – constructed with the materials deemed most durable for success in today’s world: faith, history, science, literature, language and service. This issue includes features on Augustana students and alumni who illustrate the idea of “intersection” in action – they are individuals from a variety of backgrounds and majors – but they all say the same thing: the liberal arts education they are receiving or have received here will help prepare them for where they want to go tomorrow. David Wolter, class of 2004, is a great example. David had planned on majoring in business but instead, pursued his love of drawing. He changed his major to art, developed a comic strip for The Mirror, the Augustana student newspaper, and recently landed his dream job as a story artist with Dreamworks. “So many things [I learned at Augustana] dove-tailed nicely with what I’m doing now, such as “Creative Writing” with Dr. Patrick Hicks and “World Making” with Dr. Richard Swanson,” he said. I’m curious – have you, too, found yourself at an intersection yet? I’m hopeful you’ll consider joining us at Augustana to learn where your life’s path can take you.